What if your nose is blocked? How much salt should be added? How warm should the water be? Jala Neti is the Sanskrit word for “nasal cleansing with water”. Practically speaking, Jala neti is simply nasal irrigation with saltwater. I first learnt about Jala neti on Oprah. Both Oprah and Dr. Oz were raving about it and they did a live demo where they enthusiastically poured water into one nostril and it flowed out of the other. I was intrigued. But the idea of pouring water up my own nose sounded painful. I imagined that it would feel like those times I accidentally inhaled pool water up my nose while swimming. Still, I was very curious and I started to read up on reviews and user experiences of using Jala neti. They were so good that I eventually mustered up the courage to give it a try. It took me a while to get the hang of it because eventhough I had watched a few online “how-to” videos, doing it in practise is always different. But once I figured it out, I have to say that Jala neti is very simple to do and is just as great as all those rave reviews I read. What’s so great about it? Well, I used to get a runny nose every so often. These made me so miserable that I started carrying cold pills in my handbag. I also used to sneeze a fair amount and found it hard to stop once I start. I attributed my bouts of sneezing to dust in the air. I would also get a blocked nose every so often. This was worse at night as that meant that I would have to sleep with my mouth open and I would wake up in the morning with a dry and painful throat. The only downside to nasal irrigation is that I’ve become much more sensitive to some smells and pollutants. For example, I find certain types of perfumes extremely offensive now. It’s like I can smell all the fake chemicals used in the scent. I also find cigarette smoke, fumes, and car exhaust more intolerable. So much so that I’ve learnt to hold my breath at times when I’m outdoors. Nasal irrigation or Jala neti works because it uses salt water. And salt water is a natural anti-bacterial. The flow of salt water through the nasal passage gently flushes the dirt, airborne allergens (dust and pollen), pollutants and bacteria-filled mucus. The warm salt water also loosens and thins the mucus, making it easier to expel. Without this build up of mucus, the tiny hairs in the nasal passage (called cilia) is able to do its job again – which is to wave back and forth pushing mucus either to the back of the throat or to the nose to be blown out. Jala neti is also said to stimulate the pituitary and pineal glands. The pineal gland is found in the middle of the head while the pituitary gland is between the temples. Both glands work to regulate the hormonal system. In meditation practices, Jala neti is also said to lead to the opening of the Anja Chakra, otherwise known as the third eye (path to inner sight). While I really have no idea if that is true, I have to admit feeling remarkable clarity after Jala neti. My head feels lighter and my mood is greatly lifted. So regardless of why it works, the results are quite real, and that’s what matters. 1. A small container with a spout that can comfortably fit in or against your nostril. You don’t have to buy a neti pot. I used a small plastic bowl that had a small spout on the rim. It works great. You can also use a bottle that has a small enough spout like a sports water bottle. If you have old toys lying around, a plastic toy teapot may also work well if the spout is a good size. If you do go with a neti pot, be sure to check the user reviews first. Neti pots have sold extremely well so user reviews are abundant on sites like Amazon. It’s good to check the reviews as some ceramic models can be prone to breakage or chipping, while some plastic models may have a jagged seam on the spout, making it painful to put against your nostril. 2. Salt. I used sea salt. Regular salt will work too. Some sites selling neti pots will market pre-measured individual salt packets, but this is a rip-off. Salt is very cheap. And once you get the hang of Jala neti, you’ll know exactly how much salt to add to your water. 3. Warm Water. You need water that is slightly warm, close to your body temperature. You should do this over a sink or basin. Mix some salt and lukewarm water thoroughly in your container. Stir or shake it until all the little salt granules have dissolved. You don’t want salt granules pouring down your nose, trust me. Bending at the waist over a sink, tilt your head forward and down. 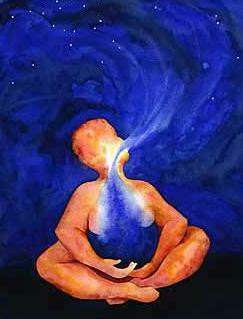 Open your mouth and start breathing through it. Relax yourself. Tensing up will make it harder for the water to flow through. Tilt your head and slowly start pouring the water down one nostril. Keep breathing through your mouth throughout instead of your nose. If you feel the water running down the back of your throat, tilt your forehead down a little more. Once you get the angle right, the water should flow easily into one nostril and out the other. When half the water is gone, blow out the water through your nose. Some mucus should be expelled – this is normal. Tilt your head the other way and use the other half of the water for the other nostril. When you’re done, blow your nose out thoroughly again. If your nose if completely blocked, then the water will not flow through. But pour the water down your nostril anyway. The salty water will flood the nostril and spill over. After several seconds of this, blow out the water through your nose. Mucus should come out. Continue pouring the water into the blocked nostril and blowing it out. You may have to do this several times and also have to refill your container once or twice. After enough mucus has been expelled, your nose will be unblocked and the water should flow through, cleaning your nasal passage. The reason behind adding the right amount of salt and having water that’s just the right temperature is so that the nasal irrigation would be virtually painless. Using water that’s not salty enough can lead to a burning sensation. This won’t cause any serious problems but would be uncomfortable for a little while. Using water that’s too cold can be similarly uncomfortable and may even trigger the body’s “drowning response”. But if the salinity and temperature is just right, then performing Jala neti will feel like nothing at all. This is because the water flowing through your nasal passage matches your own body’s salinity and temperature. Your body doesn’t reject it. If you check online, there are various guidelines as to how much salt should be added to the water and how warm the water should be. These guidelines can be confusing, and sometimes not particularly practical. For example, if you’re traveling, you may not have a teaspoon handy. The easiest and most accurate way to know how much salt to add is to taste it yourself every time. The water should taste like your tears. Tears are relatively salty so if your water tastes bland you may have to add a little more and taste-test it again. If it’s too salty, add more water until you get it about right. You can test the water temperature the same way you test milk for a baby – just drip a little on your wrist. It should be lukewarm or close to your body temperature. If you need a reminder, just breath out against your hand. That’s pretty close.